Our educational curriculum fosters the development of student learning by cultivating critical thinking skills, problem solving strategies, and attitudes of discovery and curiosity. Teachers employ multiple approaches to accommodate individual learning styles and levels of development. Friedel strives to focus staff energy toward continuous school improvement efforts to build an organizational culture that nurtures student self-direction, engagement, and preparation for high school and beyond. The Nebraska State Department of Education coordinates statewide efforts to design and develop a written standards and ensure best practice classroom instruction. Friedel Jewish Academy follows the State’s Content Standards and utilizes student achievement assessment data to assist the school in improvement planning. Content standards or learning goals/expected learning outcomes have been set for each grade and subject. 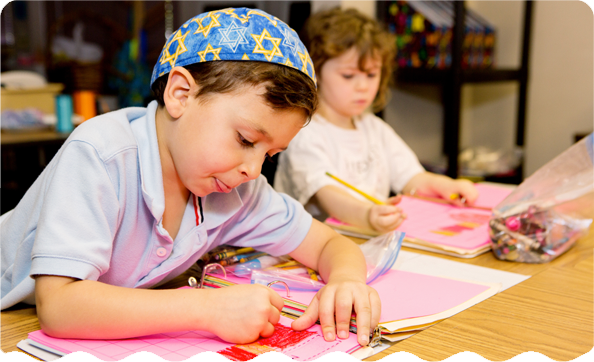 Students at Friedel Jewish Academy are expected to master the majority of the outcomes. Each classroom has a full-time, certified teacher leading instruction in math, language arts, science and social studies. Instruction is supplemented by specialists in art, music, physical education, and innovation learning.